Duac can clear up 50% of blemishes in two weeks! Duac cream is a combination of the antibiotic clindamycin with the antibacterial product benzoyl peroxide. The advantage of Duac over nearly all other prescription acne treatments is that it gets to work fast. Up to 50% of blemishes may disappear in the first two weeks. Some people will find the benzoyl peroxide in Duac irritating to the skin. If this happens, be sure to use the product at night rather than in the morning. People with brown or Asian skin types can stop skin pigmentation before it starts by taking care to use sunscreen when Duac treatment, and by applying vitamin E creams to the skin during the part of the day Duac is not in use. Moisturizer can prevent flaking and drying of the skin when using Duac. What’s Special About the Ingredients in Duac? Clindamycin is the antibiotic of choice for fighting acne in Canada and the UK. It has one very important advantage over the antibiotic minocycline, which is used in the USA. Minocycline can stain teeth, and clindamycin will not. Dermatologists in the USA usually reason that any staining of the teeth by minocycline will be at the gum line and “won’t be all that bad,” but doctors in Canada and the UK seldom prescribe minocycline to anyone under the age of 22. Benzoyl peroxide is the world’s most commonly used acne treatment. It breaks down into two compounds, hydrogen peroxide and benzoin, both of which are slightly irritating (and sometimes more than slightly irritating) to the skin and both of which kill acne bacteria, although in different ways. The addition of benzoyl peroxide to the formula gets the acne bacteria that clindamycin leaves behind, and helps reduce the risk that antibiotic treatment could create a new strain of bacteria that is resistant to existing antibiotics. The advantage of Duac over other combination products is that it starts to work fast, usually in 48 hours or less. It gets rid of significantly more blemishes than competing combination product Zineryt, nearly twice as many in the first week, and about 10% more by the end of four weeks. Duac also works faster than Differin. In fact, the difference between Duac and Differin is even more pronounced than the difference between Duac and Zineryt. A clinical trial conducted at Warsaw Medical University in Poland found that Differin got rid of 25% of blemishes in two weeks, but Duac got rid of 45% of blemishes in the first 14 days of treatment. Duac does not get rid of every blemish on acne-prone skin. No treatment does. However, over 2/3 of whiteheads, blackheads, and pimples should disappear in 30 days or less. Who Benefits Most from Duac? Duac gets rid of all kinds of blemishes, but it is more effective for pimples than for whiteheads and blackheads. The benzoyl peroxide in Duac can bleach clothes and towels, so you need to use white bath linens if you use this product, and you need to keep it off shirts and blouses. Duac contains 5% benzoyl peroxide. Many people complain that this concentration of benzoyl peroxide stings, especially at first. It can also cause redness and irritation of the skin. Duac is hard to hide beneath makeup, and you may need green concealer to hide pimples, because pimples treated with Duac may shine through gold or brown concealer or foundation. What Can Go Wrong With Duac? Aside from bleaching clothes and causing skin irritation, the most common problem with Duac treatment is that acne sometimes comes back with a vengeance when you quit using the drug. The way to prevent this is to continue using a 2% to 4% benzoyl peroxide product for at least a week or so when you stop using Duac. It is a good idea to use a moisturizer if you use Duac. If you use Duac at night, then you can apply the moisturizer at night over the layer of Duac. It is important not to use an alcohol-based moisturizer if you are using Duac; no matter what your skin type, the combination of alcohol in any skin care product and benzoyl peroxide in Duac will dry out your skin. Taking the moisture out of your skin is not good for acne. It traps oil in pores by tightening your skin. 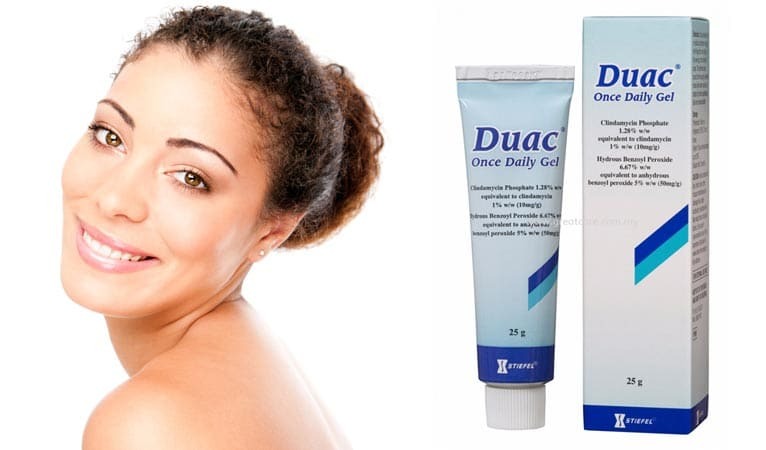 People who have Asian skin types sometimes experience browning of the skin after pimples have been cleared with Duac. Prevent this by using at least SPF-15 sun block (sun block in your moisturizer is OK) during the day, and by using arbutin powder and/or a moisturizer that contains vitamin E cream at night. Don’t use the vitamin E cream or lotion during the same part of the day as when you are using Duac; the benzoyl peroxide in the product can neutralize vitamin E.
In rare cases, people get the clindamycin component of Duac into their digestive tracts. In the colon, the antibiotic can kill almost all bacteria except Clostridium difficile. The Clostridium bacteria trigger severe diarrhea and can even grow in a thick, membrane-like coating over the colon that can stop absorption of water into the bloodstream. See your doctor the same day you develop diarrhea if you are using Duac. Is Duac Enough for Fighting Acne? Duac is great for fighting pimples and for getting results fast. The thing to keep in mind about using Duac is that it almost never gets rid of 100% of acne blemishes. To do that, you will need a complete skin care system. What makes a skin care system complete? Ideally, you need a cleanser to keep pores from getting clogged, a skin tonic to help loosen hardened sebum to take the “black” out of blackheads, a moisture complex to keep your skin from drying and flaking and to keep your pores open, a microdermabrasion cloth to slowly remove brown spots and smooth out scars, and a clarifying mask that will pull oils out of your skin (as well as feel really good). This acne treatment kit should contain no ingredients that can irritate your skin and nothing that can cause allergies. Even better, it should come with a one-year money-back guarantee. One such acne treatment kit is offered by Exposed Skin Care. Is it safe to have laser treatment on my face whilst using zineryt lotion.